Known as an ideal first farm location, Galatea in the Bay of Plenty’s Whakatane district was first settled in the 1940s, when it was balloted to give returned soldiers a start in farming in gratitude for their war service. 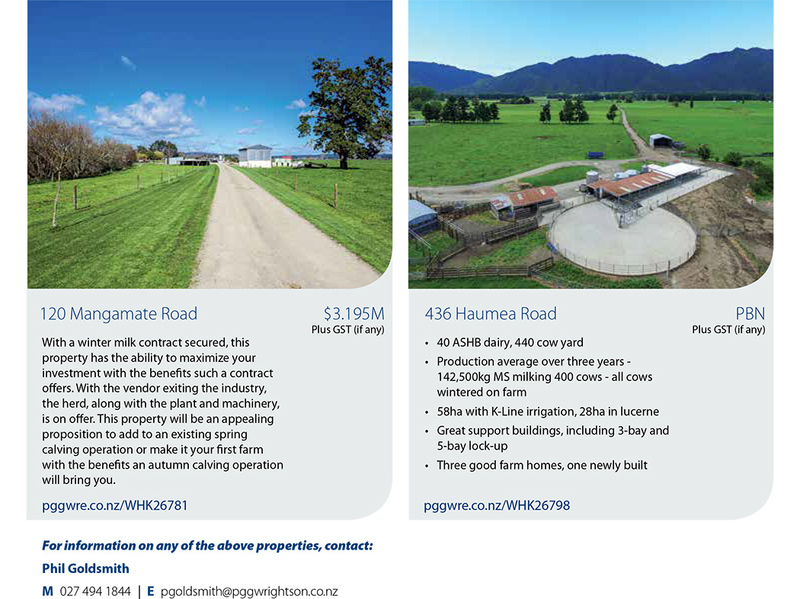 Phil Goldsmith of PGG Wrightson Real Estate, Whakatane, knows the 10,000 hectare valley well. Predominantly in dairy, he says it offers good returns. 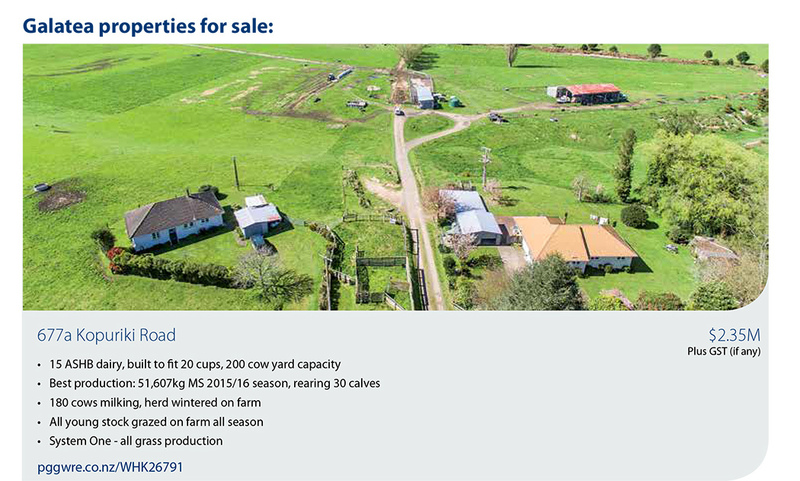 “Dairy land in the valley, capable of producing 1,000 kilograms of milksolids per hectare, has sold recently for up to $35,000 per hectare. That compares to Waikato, where production may be 10 to 20 per cent higher, on land that would typically cost double what you might pay in Galatea,” he said. Farmers seeking a second or third property also benefit. “Rather than buying half the neighbour’s property elsewhere, for the same money you can buy a stand-alone farm in Galatea,” says Phil. After the war, with an influx of families of a similar age and outlook, the newcomers to what was then an isolated valley almost immediately became a supportive community, whose spirit remains today. Although the old soldiers have nearly all passed on, many of their families remain. Colin Holmes’ father was a returned soldier who took land at Galatea. He reckons about 20 per cent of the valley is still in those families’ hands. “In the early days, it was an incredibly tight- knit community, with everyone around the same age. Within a decade, the local school went from five pupils up to 200, and the school maintains its place as the heart of the community. Surrounded by Te Urewera and the Kaingaroa Forest, our boundaries are distinct, though modern communication has eased the isolation,” says Colin. He reckons Galatea’s outstanding points are its topography and the workability of its soils. “Although thin originally, grazing has improved the topsoil. We sit on deep layers of pumice. Its free-draining characteristics make it good land to work. If you farm here awhile, wetter districts do not appeal. We know if we are sick of mud in Galatea, others will be absolutely tearing their hair out,” he says. AgFirst’s Mark Macintosh has advised Galatea clients for 20 years. He agrees it is a good area for a first farm. “With several younger farmers, who are keen and progressive, for anyone coming in, there are people to tap into to learn about the place and how to farm. pugs. Its cooler climate means grazing some stock off-farm will help negotiate the winter, leaving feed available in the spring,” says Mark. Looking ahead, Colin Holmes sees great prospects for Galatea to become fully irrigated. “All the water that causes problems further downstream comes out of Te Urewera, through Galatea. Storage is the key. We have the possibility to combine flood mitigation for the Rangataiki Plains with storage for irrigation for Galatea. When there is plenty of moisture, our growth rates are phenomenal. If you add water, all the conditions are here. A community irrigation scheme here one day is inevitable,” he says. See the incredible Galatea opportunities here.